Create screensavers using your favorite websites or keyword search! It's very easy to use. Just type in keywords or web addresses. For example, if you type a word "dream", "love", "sky" or "relax", all corresponding images found on the Internet are going to appear in the screensaver. Similarly, if you type e.g. www.finalhit.com, the screensaver will display this website. For home users: Live Screensaver Creator is great for displaying images of your favorite celebrities, movies, landscapes, or whatever else you can imagine, for use on your own computer and sharing with friends and relatives. For business users: Live Screensaver Creator allows companies to build screensavers based on their websites and as such, it can act as an advertising tool by displaying corporate websites or showcasing products. The screensaver is created once, but its contents change with every website update. 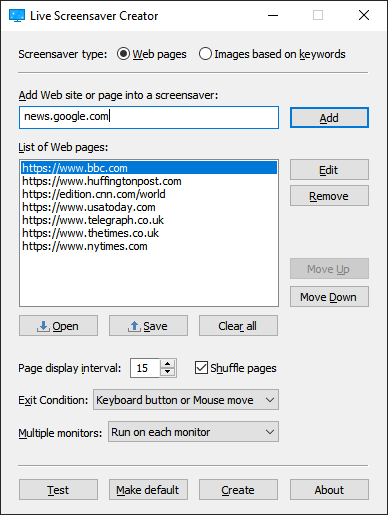 Instant preview: You can preview the screensaver at any time and can easily change the keywords or websites to create another screensaver. When satisfied with the results, you can set the screensaver as your default Windows screensaver. Share for free: If you want to share created screensaver with others for free, you can build its installation package by using a "Create" option. Changes: Version 2.6 has redesigned icon and installation wizard image.